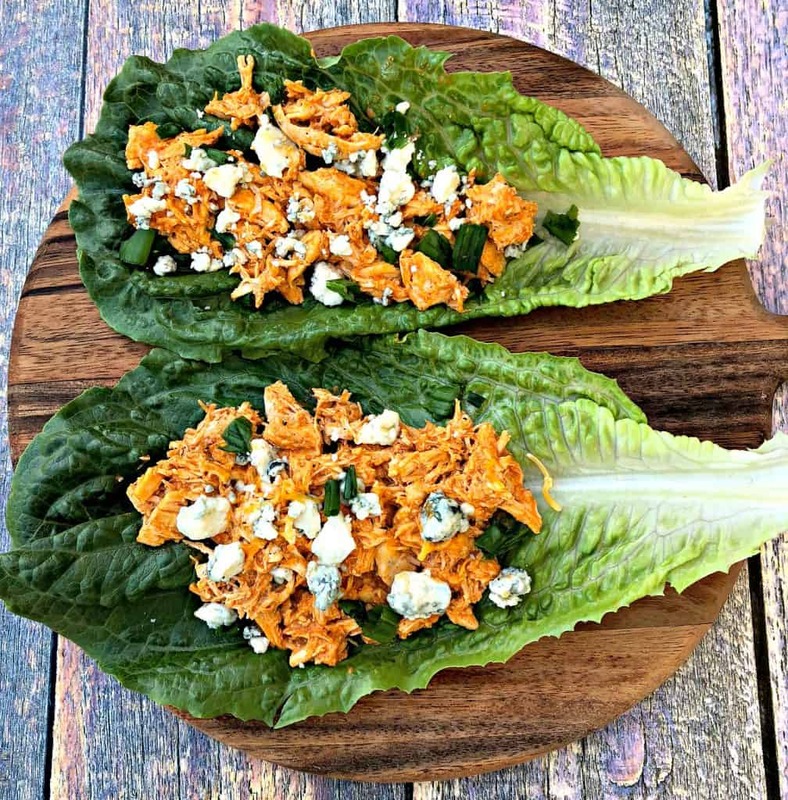 Instant Pot Keto Low-Carb Cheesy Buffalo Chicken Lettuce Wraps is a quick and easy pressure cooker recipe with chicken breasts, Frank’s Red Hot Buffalo Sauce, gooey cheddar cheese, and then sprinkled with blue cheese and green onions. This recipe takes 30 minutes to make and is perfect for weeknight dinners or advanced meal prep. Have you joined our Instant Pot, Air Fryer, and Easy Recipes Facebook Group? You don’t want to be the only one missing out! Join here. 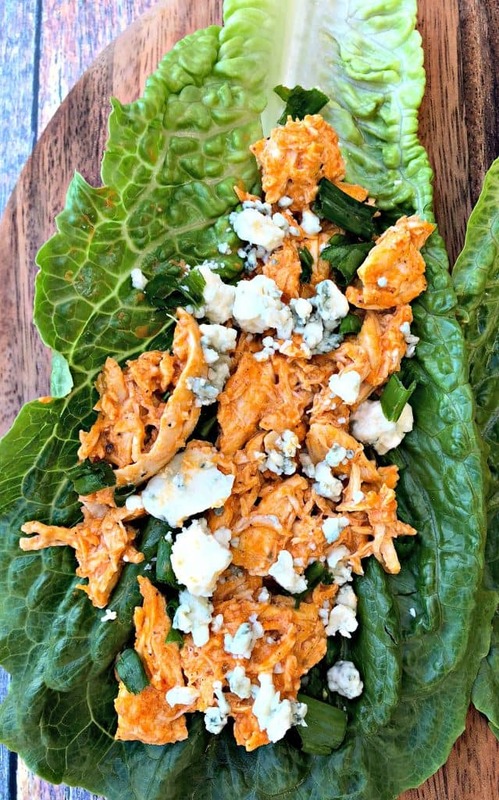 This recipe is very similar to my Low-Carb Buffalo Chicken Dip recipe. I use plain, non-fat Greek yogurt (adds protein) and cream cheese for a little more creaminess. I use a lot less of these than I do in the dip for optimal texture. If you do not have an Instant Pot you can make your chicken breasts using a slow-cooker or crockpot. Cook the chicken in the slow-cooker with chicken broth for 4 hours on High or 8 hours on Low. All of the other directions in this recipe will remain the same. While I absolutely LOVE carbs….pretty much ALL carbs and bread…I have to exercise balance. Eating dishes that are more healthy can be incredibly easy, if you select the right combination of ingredients. My goal is to never compromise on taste! 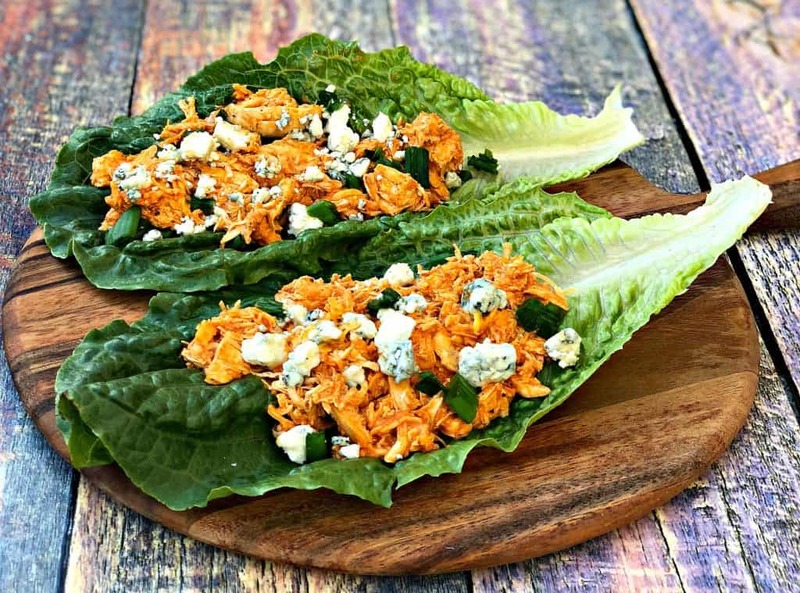 There are so many ways to enjoy lettuce wraps! Be sure to check out my Low-Carb Spicy Carne Asada Steak Lettuce Wraps as well! Here is what I love about the Instant Pot….the machine makes it so easy for us with hectic lifestyles! I threw the chicken breasts in the pot with the broth. Set the timing and then moved on to prep the remaining ingredients. I love to use romaine hearts for the lettuce because it is large enough to hold enough filling for one large serving. You can also use butter or bib lettuce. 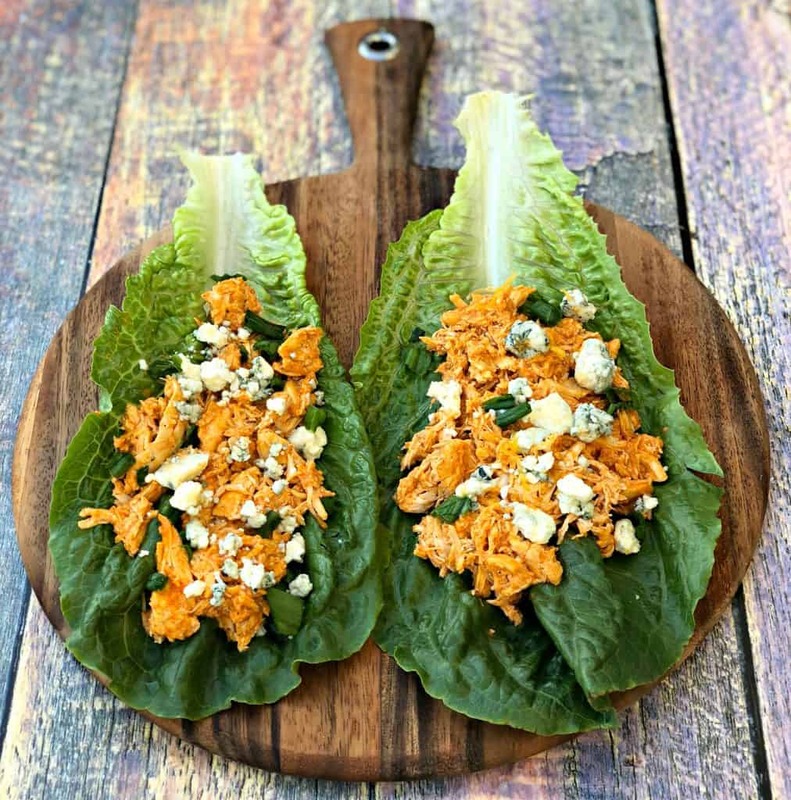 I used crumbled blue cheese, feel free to use keto-friendly blue cheese dressing. Drizzle the dressing on top of the lettuce wrap. It sounds amazing. I will definitely try that out the next time I prepare these wraps. One wrap may be enough for a meal for you. I paired my lettuce wrap with a side of sautéed mushrooms and once with steamed broccoli. You really can’t go wrong with this recipe. I like to meal prep my lunch for work on the weekends. For meal prep purposes, I stored my romaine lettuce in large plastic Ziploc bags. I packed the shredded chicken and crumbled blue cheese in separate Tupperware containers. This way, I was able to reheat the chicken separate from the lettuce and enjoy a crunchy, fresh lettuce wrap each day. 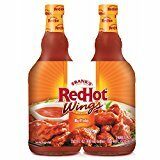 Here is a link to the Frank’s RedHot Wings Buffalo Sauce used in this recipe. 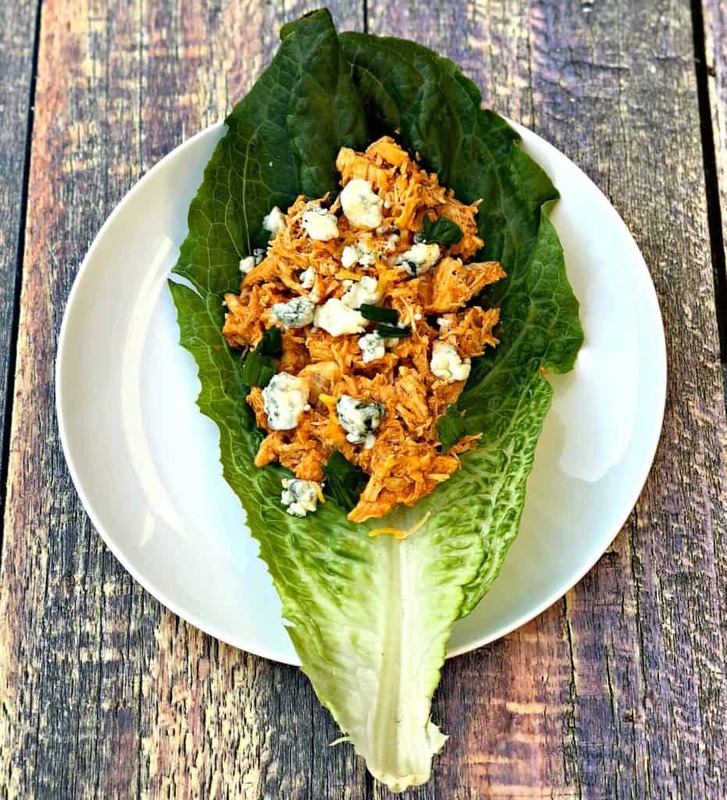 Instant Pot Keto Low-Carb Cheesy Buffalo Chicken Lettuce Wraps is a quick and easy pressure cooker recipe with chicken breasts, Frank’s Red Hot Buffalo Sauce, and then sprinkled with blue cheese and green onions. This recipe takes 30 minutes to make and is perfect for weeknight dinners or advanced meal prep. Close the pot and seal. Cook for 10 minutes on Manual > High-Pressure Cooking. When the Instant Pot beeps and indicates it has finished, allow the steam to release naturally for 10 minutes. Do not quick release. Open the pot and remove the chicken. Shred the chicken using a knife and fork or two knives. Drain the leftover chicken broth from the Instant Pot. Place the Instant Pot on the sauté’ function. Add the shredded chicken back to the pot. Add the buffalo sauce, cream cheese, Greek yogurt, shredded cheddar, chicken seasoning, salt, and pepper to the pot. Stir to combine all of the ingredients. Cook for 2-3 minutes or until all of the cheese has melted. 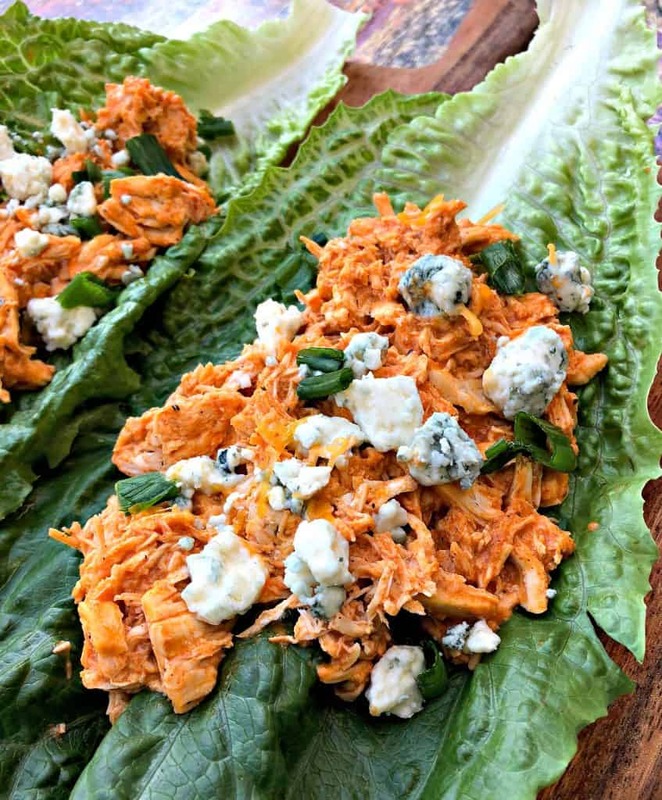 Assemble the lettuce wraps with the buffalo chicken mixture, crumbled blue cheese, and chopped green onions. 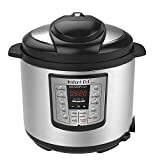 Total cook time above includes time for the Instant Pot to come to pressure and to naturally release the steam. Because the chicken is cooked in broth it will have some flavor. Be cautious with how much seasoning, salt, and pepper you add. This recipe shouldn't need much. Add a small amount, taste a little, and adjust if needed. Blue Cheese and green onions. Yummy! Add your chicken in and and I’m hooked. 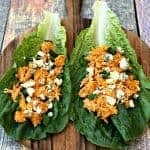 These lettuce wraps look absolutely delicious. Will try them tonight! That’s so awesome you’re keto! Thank you for including options for those of us who do not have an instant pot. It looks delicious and I can’t wait to make it. 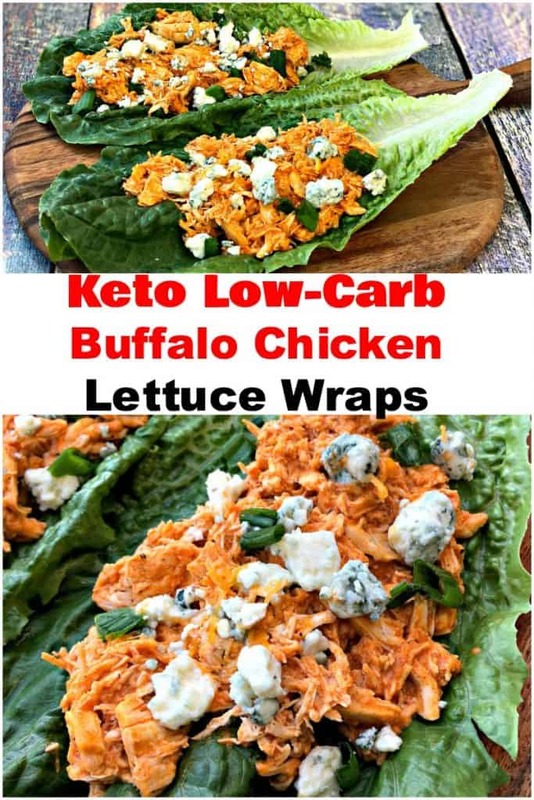 I’ve never thought of putting buffalo sauce in a lettuce wrap. Why not – is sounds delicious! Low carb is always welcome. Can you use frozen chicken for this and if so, is there a longer cook time? I’m new to the Instant Pot. Yes. I don’t use frozen meats while cooking. The Instant Pot website and manual includes cook time from frozen. If I want to double the recipe, does the cook time need to be doubled? I’ve read somewhere that that’s not always the case for instant pots so I wanted to inquire first….. thanks! No, the cook time for the chicken should remain the same. It may take a little longer to get the cheese and other ingredients to melt while using the saute function.